Known for its breath-taking views of Table Mountain across Table Bay, Bloubergstrand is a suburb of Cape Town that has taken on an identity of its own, almost being recognised as a little town in its own right. It is mainly a residential area, with plenty of holiday accommodation. Its long stretch of beach is very popular for watersports and kiting. This area has a strong tradition, having been an important part of the local fishing industry and the community of yesteryear. Much of the fare that is enjoyed here is, naturally, seafood, thanks to the fresh catches from Table Bay. Other favourites include freshly baked bread, toasted on the fire, as well as salty fish grilled with apricot jam and other sweet preserves. Because the entire area is protected as a Marine Nature Reserve, certain of the marine species are not allowed to be taken from the water or killed (such as abalone and the Cape rock lobster). Even some fish require the angler to be in possession of a licence. There are often schools of dolphins and groups of seals in and around Bloubergstrand. Every year, in the latter part of the year, graceful southern right whales can be seen frolicking off the coast. Sometimes, killer whales also make an appearance, delighting those on the shore with their antics. Bloubergstrand’s beach is bedecked with white sands, which are rinsed by the cool waters of the Atlantic Ocean. The area is known for its trade winds, which create the ideal conditions for kitesurfers and kiters. These ones are often seen in even very tricky conditions, doing what they love and challenging themselves. The waves are also great for surfers, who are almost always willing to brave the cold water for a day of surfing. The large sandy tracts make for the perfect play area for the young and the young at heart. 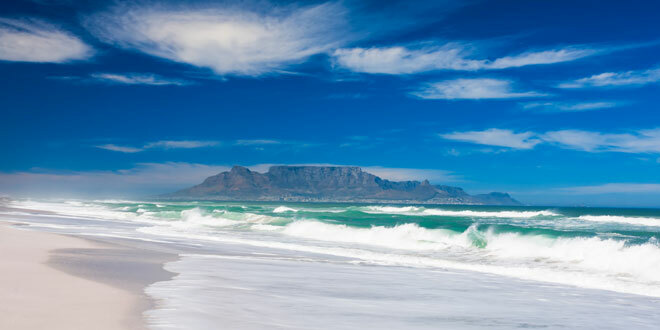 The views of Cape Town’s city centre and Table Mountain from the Bloubergstrand beach have become famous all over the world, often appearing on postcards and in coffee table books as a representation of the Mother City.